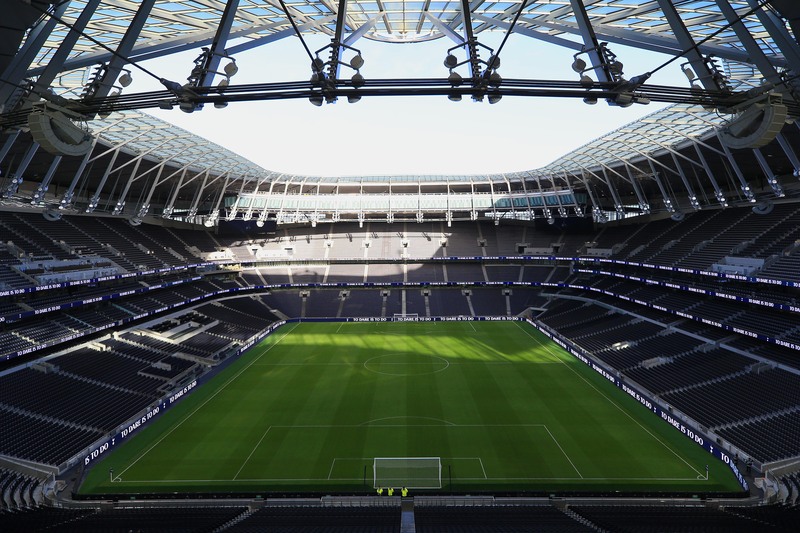 As sports venues evolve to counter the increasingly immersive broadcast experience that fans get at home, the UK has fired its latest salvo in the battle: Tottenham Hotspur Stadium. “The Tottenham Experience” (the venue has not yet been officially named) begins well before football fans reach the gate. The exterior of the facility boasts a glittering cladding of 35,000 tiles, 4,801 of which are perforated metal panels that make up the stadium’s overhead “veil,” fitted to modular frames affixed to the rear of the stands, along with 2,505 glass panels. Inside, 17,500 of the stadium’s 62,062 seats are in the South Stand, the largest single-tier stand in the UK, reaching more than 110 ft. high. From there, fans overlook an enlarged pitch (105 x 68 meters vs. the 100 x 67 meters of the White Hart Lane stadium, which previously occupied the site), which can slide in and out of the venue, a trick that NFL Arizona Cardinals fans will be familiar with. However, instead of being used to expose the grass of an enclosed stadium to water and sun, the sliding pitch will reveal an artificial surface intended to accommodate, among other things, a minimum of two NFL matches every year for the next decade. The soccer grass pitch is in sections on rails and slides out to reveal an artificial surface for NFL matches. The soccer grass pitch sits in three pitch-long steel sections, weighing more than 3,000 tons each, driven by 68 electric motors, and rolling along rails on 168 wheels. The sections slide out simultaneously in approximately 25 minutes and then move laterally to create a seamless surface. Once the sections are connected, the hydraulic sides lift to bring touchlines to the same level as the pitch. When not in use, the grass pitch retracts into a storage garage in the South Stand, where it can remain for up to 10 days, thanks to LED lighting, cooling, and irrigation systems. 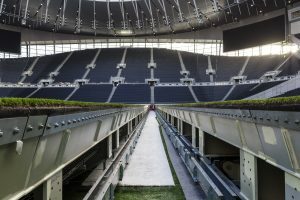 The new Tottenham Hotspur Stadium will rely for now on the same broadcast infrastructure that its predecessor used, including the production-truck compound on the east side of the stadium and cabling to BT Tower for transmission for BT Sport and Sky Sports. The new venue will offer plenty of audio and video. Six bespoke main LED video displays installed by Daktronics inside the stadium bowl total nearly 11,000 sq. ft. Two of them, in the South Stand, measure 3,500 sq. ft. each and are the largest stadium screens in Western Europe. Two LED video displays, each measuring 1,925 sq. ft., are fitted on the stadium exterior, on the South West and South East facades. TGI Worldwide-installed perimeter LED screens circumnavigate the pitch. And nearly 1,800 HD TVs are scattered throughout the stadium’s general concourse and premium areas. 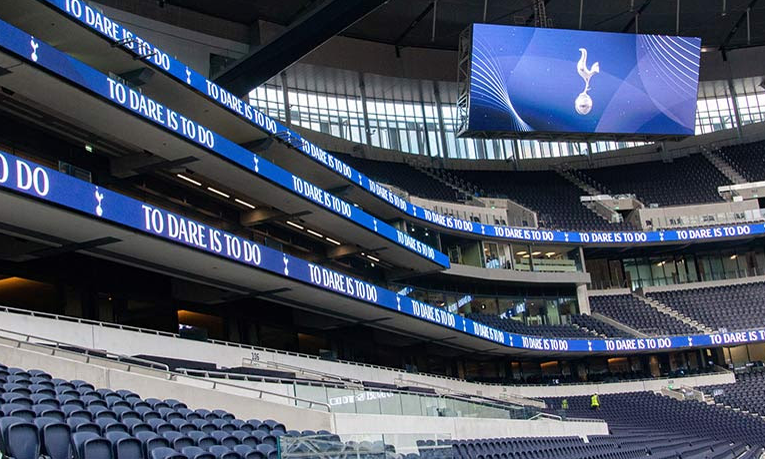 LED ribbon boards on the perimeter of the pitch are part of a massive video offering at the new Tottenham Hotspur Stadium. Audio comes through loud (“Very loud,” says venue Head of Technology Sanjeev Katwa) and clear, via 4,500 JBL speakers of various types installed throughout the stadium. 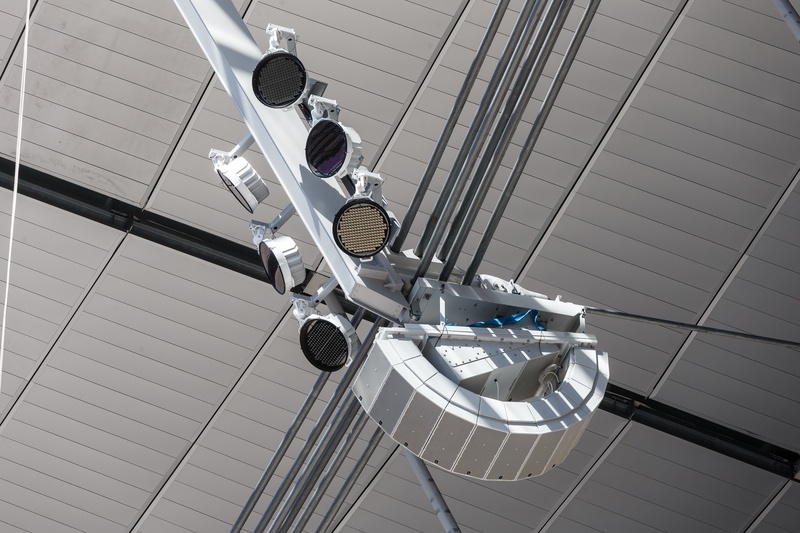 These range from the 18 VLA-C weatherized compact line arrays ringing the bowl, a design derived from JBL’s concert-touring VTX series speakers and intended to connect with touring sound systems that accompany concerts there, to the CBT columnar speakers in back-of-house areas. The entire audio system is on a Dante network, as are the 153 Crown amplifiers powering it. “Each of the speakers in the arrays can be zoned separately, so there’s a lot of flexibility both in the design and the way they can be programmed,” explains Ryan Penny, senior business development manager, large venues, EMEA, HARMAN International. “And the line arrays have 120 degrees of coverage, which is unique for European stadiums.” (The audio consultant on the project was Joe O’Herlihy, longtime audio director and live-sound engineer for U2. Penny’s comments underscore what the new Tottenham Hotspur Stadium is meant to do and to signify. Like a growing number of sports venues in the U.S., it’s designed as a destination for more than football matches. It houses 65 pubs and restaurants and is the first football stadium in the world to house its own microbrewery. It will soon feature retail shops and a hotel, which will all contribute to drawing a forecast 2 million visitors per year. Katwa says the new stadium is Europe’s most advanced sports venue, but his benchmarks go far beyond sports; he compares it not with other EPL stadiums but rather with other “destination” venues, such as the new Terminal 5 at London’s Heathrow Airport and the Dubai Mall, the world’s largest and most visited shopping center. He also says network technology is at the core of the project. Featuring 4,500 JBL speakers of various types, the audio system at Tottenham Hotspur Stadium is on a Dante network. “Our technology here has been focused on the network; it’s the core of our entire technology journey,” he says, citing the stadium’s extensive Wi-Fi and broadband infrastructure, which was used experimentally at one of two games preceding the opening match on April 3 (vs. Crystal Palace FC) for staff communications throughout the venue, supplanting the radios usually used. Katwa also emphasizes that the new venue meets the NFL’s media-technology requirements, in part by working with the same vendors the league collaborates with in the U.S., such as Harman Professional and Daktronics.